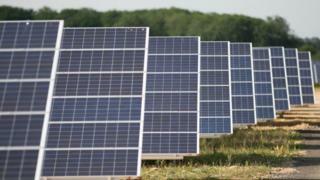 Some 576 jobs in the solar power industry have been axed and 1,600 more are at risk because of planned cuts to subsidies, a trade body has found. These are on top of about 1,200 already lost in high-profile company failures. The Solar Trade Association surveyed more than 200 solar firms - estimated to be fewer than 10% of the total. It said if its findings were reflected across the industry, some 6,500 jobs may already have been lost and a a further 18,500 could be at risk. The government says that the decision on the size of the cut to a key solar subsidy is expected in the coming weeks. The survey offers the most up-to-date account of the potential impact on jobs of proposed cuts. The survey found that 90% of firms say that jobs are at risk. A quarter of firms say that their business is at risk of closure. "When your local solar company around the corner makes one of its installers redundant, it doesn't hit the headlines like when a company goes bust," said Leonie Green of the Solar Trade Association. "But we now know that over 500 of these jobs, and probably thousands more, have already silently disappeared in communities up and down the country." About 1,200 jobs have already gone with the collapses at the Mark Group, Southern Solar & Climate Energy. The industry has been hit by a series of government plans aimed at cutting financial support to renewable energy. In July the government proposed an 87% cut to the feed-in-tariff - the key subsidy which supports domestic and commercial rooftop solar and some small solar farms. It has also proposed to exclude solar from the Renewables Obligation, a scheme which supports larger-scale projects. The solar industry insists it can, by the end of this Parliament, compete without subsidy for rooftop solar if support is tapered off slowly. Despite the planned cuts, Energy Secretary Amber Rudd has said that she believes the solar industry will "continue to thrive". The government believes the technology is almost ready to stand on its own feet without subsidy. Without the cuts, it says there would have been higher deployment of solar, leading to an increased burden on the renewables budget and our domestic energy bills. But the ultimate impact of the subsidy cut will depend upon the level at which it is set. A decision is due within the next month. "Our priority is to keep bills as low as possible for hardworking families and businesses, while reducing our emissions in the most cost-effective way", DECC said. "We have engaged extensively with industry and the public via the Feed-in Tariff consultation and we intend to publish a Government Response later in the year." The Solar Trade Association say that the survey represents 9% of the 2,380 UK solar companies. It claims that if the findings reflect the whole industry then 6,500 jobs may already have been lost with a further 18,500 at risk. It concludes that an estimated 25,500 jobs have either been lost or are at risk since the election in May.